A crop circle appears in a field near Bucks, Pennsylvania, and the owner must cope with the repercussions this has on his family, and eventually the entire world. all heaped on the plethora of deeper problems already festering in his heart. Before science fiction and fantasy films became box office gold. back when sci-fi was the stuff of pulp serials, cheap cardboard cutouts and stiff-armed PVC robots with gorilla heads, most movies dealing with subjects like alien invasions took place on a farm somewhere in the Midwest, chronicling the event from the perspective of some shmoe and his buddies; this was often necessary due to budgetary constraints. 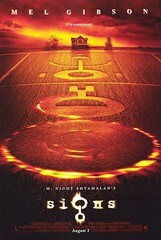 What’s beautiful about M. Night Shyamalan’s “Signs” is that-with the status to command a budget and an ability to outdo Emmerich and Devlin’s “Independence Day”-this director intentionally chooses to downsize the landscape and focus on a small rural family in Bucks, Pennsylvania. However, “Signs” is far from an homage to the cheesy monster flicks of the 50s. this movie focuses on the family because it is everything that matters; crop circles, world-shattering invasions, these things are all peripheral. The disturbing center of the film is Gibson’s character, and the mystery that unravels over the course of the film is the secret of why his heart has hardened against God. What the viewer receives from this film trumps all city-smashing spaceships and shape-shifting metamorphs; this film begins in a chilling vacuum and ends with the discovery of its soul. Gibson allows himself to be molded by director Shyamalan, producing a unique and nuanced character in the role of former pastor Graham Hess, though bearing many of the same defeated, reticent traits common to M. Night’s previous main characters in “The Sixth Sense” and “Unbreakable”. Though the film begins with the discovery of a crop circle on his property, the tension in Graham’s family and relationships are already enough to make the viewer shift uncomfortably in their seat. Through a series of methodical flashbacks throughout the film, we understand why local baseball hero and Graham’s brother, Merrill (Phoenix), has come to live with them, what happened to the mother of Graham’s children, and why he left the pulpit. As the suspense grows, and the viewer grips their seat tightly as if they were in one of Hitchcock’s better thrillers, the desire to wrap one’s mind around Gibson’s psyche, and come to terms with the tragedy in his life, are every bit as powerful-if not more important-than the global paradigm shift happening in the movie. While the modern cinema audience may have Attention Deficit Disorder when it comes to movies, (those parties dominating the popular market will undoubtedly whine that-like Shyamalan’s two previous films-“Signs” is slow and boring) that’s fine. they can get back to their X-Box and shoot aliens to their heart’s content. What is amazing to the discerning viewer, however, is how the film can indeed be ponderous and plodding, yet so eminently engaging at the same time. There is an honest investment in characters’ emotions, a thorough study that hardly requires the equally compelling dialogue. Shyamalan’s films do not portray extraordinary situations; they explore ordinary people set against the extraordinary backdrop, and this is rarely done well, if at all. The backdrop never overshadows the players, even in the nail-biting climax. M. Night also has the capacity to bring out solid performances from his cast as a whole, rather than relying on one or two actors to carry the others. Phoenix and Culkin are held to the same level as bankable Mel, and even young Abigail Breslin delivers a memorable performance as the young daughter without being, as many child actors are, over the top. Though tremendously scary at times, the director’s subtle style delivers true horror without earning an R-rating. What we don’t see can often be scarier, and this very true in “Signs”; the film turns nervous anticipation into an art form. The true question of the film, (the existence of extra-terrestrials or life after death deftly set to the side), is a question of design. Why do bad things happen to good people? Are we (and everything else) merely random events, our very lives simply a coin toss in a universe of chaos and chance, or is there a transcendent order governing the cosmos? Can miracles happen, or do we comfort ourselves with delusion? Out of the simple lives of a weary family in Bucks, Pennsylvania-thrust suddenly into a scenario every bit as terrifying as George Romero’s original “Night of the Living Dead”-these questions are addressed. While I felt the film was very affirming for believers, I didn’t know how it would fare in a postmodern landscape. Reports from good friends about water-cooler chats already occurring would suggest that it’s already become useful. Either way, “Signs” is more than worth your time.